1927-56 Canada Christmas Seal Collection, As Required, singles, pairs, blocks, w/flaws, Avg/F, NH. 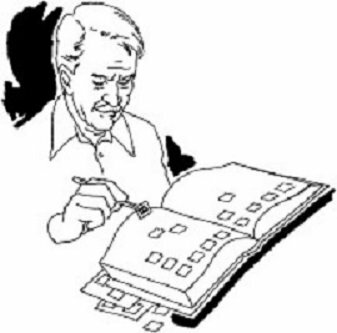 U.S. lookalikes and French and English Seals are included for years 1927-1951. Issued yearly at Christmas by the Canadian Tuberculosis Association. 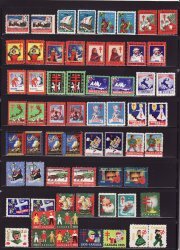 1927-56 Christmas Seal Collection. 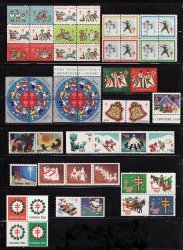 Canada Christmas Seals with U.S. lookalikes, as required, singles, pairs, and blocks. With a few straight edges and a few no gum, Avg/F, NH. French and English Seals are included for years 1927-1951. Issued yearly at Christmas by the Canadian Tuberculosis Association. Scan is an example of the collection. Seals in this packet are as follows: single stamps: 1927-1935, 1937-1942, 1944-1953; se-tenant pairs: 1936, 1943, 1955, 1956; blocks of 4: 1954. Check the contents of this collection, The collection is not just a representation of the various years. This is the assortment as described in the Green's Foreign TB Seals Catalog, and required to complete the various albums.